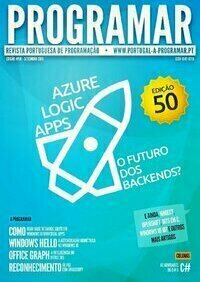 My article "Azure Logic Apps: o futuro dos backends?" just made the cover of the 50th edition of the "Revista Programar" magazine. The article describes my view of the historical evolution from Mashups to SOA to Microservices, and describes the current version of Azure Logic Apps, Microsoft's implementation of that architectural view. If you do happen to read portuguese :), the direct link to the article is here.